Accommodations: Attendees are responsible for their own meals; packing a lunch is recommended. Course Materials: All class attendees should bring a hand lens, write-in-the-rain notebook, pencil, and plant identification books. Class Description: A two-day class focusing on identification of wetland plant species. Instruction will be majority field based focusing on recognizable field characteristics. 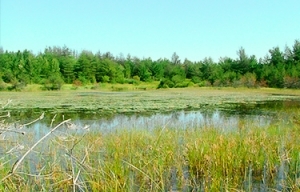 The class will examine both common and unique wetland species in a variety in wetland habitats around the Marquette area. Attendees should be prepared for all weather conditions. Waterproof boots, sunscreen and bug spray are recommended. Susan Klimas is a botanist living in northern Michigan. Susan has worked with the Great Lakes Environmental Center on field botany for the State of Michigan Wetland Monitoring Program, conducted rare and threatened plant species surveys for the US Forest Service throughout the Ottawa National Forest, taught a college course in Tropical Conservation and Survey Techniques in the Eastern Highlands of Papua New Guinea, and authored the botany section of the field manual for this course. Susan coordinated the Forest Health Monitoring Program at Pictured Rocks National Lakeshore, including identifying and mapping forest types throughout the property.